Knott Rigg standing at a height of 556 metres (1852 feet) is situated at the head of the beautiful Newlands Valley on a four kilometre long ridge below Causey Pike and Sail. Knott Rigg is steep sided falling on the western side to the valley of Sail Beck and on the eastern side falls to the minor road in the Newlands Valley between Keswick and Buttermere. The hardest ascent of Knott Rigg is from Rigg Beck or Keskadale Farm and the easiest ascent is from the car park at Newlands Hause giving an advantage start at a height of 333 metres therefore giving an easy vertical ascent of just over 200 metres. Knott Rigg is usually climbed in conjunction with Ard Crags which sits on the same ridge 1.5 kilometres to the north east. Ard Crags at 581 metres (1,906 feet) is closer to the higher fells such as Causey Pike and Eel Crag and can easily overlooked but from the Newlands Valley it is clearly seen as a defined pyramid shape. It is sometimes referred to as Aikin Knott the name of the outcrop of rocks on the nose of the ridge. Both summits provide a wonderful aerial view of the Newlands Valley with a glimpse of Derwent Water and in the far distance Skiddaw, Blencathra and the Helvellyn Range can be seen. The Newlands Valley on the western side of the Lake District is one of the quieter valleys in the National Park although quite close to the busy town of Keswick and the A66 road. 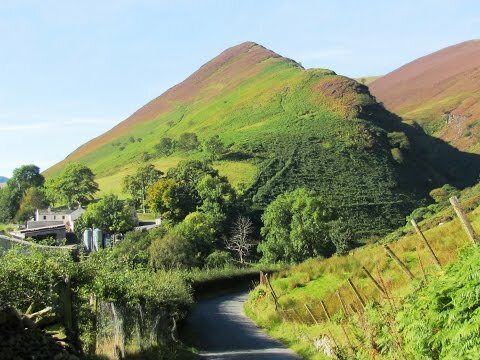 The thinly populated valley bottom consists of mainly farms and tourist accommodation and is overlooked by the fells of Barrow, Causey Pike, Cat Bells, Ard Crags, Knott Rigg, Maiden Moor, High Spy, Dale Head, Hindscarth and Robinson offering superb fell walking. The Newlands horseshoe is 8.75 miles starting and finishing at Little Town. Situated on the steep slopes of Ard Crags above Keskadale Farm is Keskadale Oakwood, an ancient woodland, which is a Site of Special Scientific Interest and a Special Area of Conservation. The valleys main hamlet is Stair which is the location of the Newlands Adventure Centre and about 1½ miles north of Stair in the only pub in the valley the Swinside Inn. Further up valley the hamlet of Little Town consisting of a farm, a few cottages and a church has been made famous by the writings of Beatrix Potter, whose 1905 children’s book “The Tale of Mrs Tiggy-Winkle” is based in the area. At the most southerly part of the valley is KesKadale Farm, a traditional sheep and beef cattle farm, which has been in the Harryman family for generations and offers accommodation. Newlands Hause at the end of the valley provides a car park which sits at the foot of the slopes of Robinson where the Moss Force Waterfall can be seen coming down from the fell. From the Hause the road descends steeply to Buttermere. The Newlands Valley was extensively mined for centuries. Lead, copper, silver and even gold has been extracted. Goldscope mine on the lower slopes of Hindscarth, which has operated since the 16th century, is the most famous mine in the Lake District. It yielded such large amounts of lead and copper that it was named “Gottesgab” (God’s Gift) by the German miners brought over to develop the mine in the early days. The mine closed at the end of the 19th century because the main shaft had gone so deep it had become uneconomic to pump water from it. The other mines in the valley are Barrow lead mine closed in 1888, Yewthwaite lead mine closed in 1893 and the Dale Head copper mine closed at the end of the 18th century. Braithwaite, only a few miles west of Keswick, is a small but quaint village in the northern part of the Lake District within the National Park. The village nestles below a fell called Barrow and is overlooked by Grisedale Pike. Coledale Beck which flows along the V shaped valley of Coledale passes through Braithwaite before it joins Newlands Beck east of the village. Newlands Beck coming from the Newlands Valleys then heads north towards Bassenthwaite Lake. For such a small village it houses three pubs, guest houses, B&B’s and a campsite with a caravan park. Not far from Braithwaite is Whinlatter Forest where there are many short and long walks to undertake. The Cockermouth, Keswick and Penrith Railway, now closed, called at a station in Braithwaite. From the quarry car park we head forward over the bridge and follow the road for about 1.5 miles until we come to a bridge over the little beck of Ill Gill. We cross over and turn immediate right uphill on the faint path with the farm and the fence on our left and the beck on our right. We cross over the stile next to the dog kennel and head forwards to cross over another stile. We turn left and follow the path, with the fence on our left, uphill through the fern. As the path levels out at an open grassy bit we turn right uphill towards the fence on our right. We now keep heading steeply uphill on the path with the fence still on our right. The path eventually levels out and at some wooden posts we cross some boggy ground heading towards the mound to the right which is the highest point of Knott Rigg. The views towards Buttermere are awesome from here. We turn right past the cairn and keep following the path, dropping down into a gap then uphill for just under a mile to the summit cairn of Ard Crags. We soon start heading downhill fairly steeply to the hump of Aikin Knott then very steeply downhill towards the bottom. When the path levels out we walk through the ferns and just before the grassy area we turn left to follow the path, quite boggy, downhill to Rigg Beck. We cross the beck at a safe narrow point and make our way to the clear path and turn right. We now follow this path back to the quarry car park. This is a hard walk on minor tarmac road, grass and stony tracks and paths. There are steep inclines and declines. Approx 5 miles allow 3 to 3½ hours using OS Explorer Map OL4, The English Lakes North Western area. This walk is done anti-clockwise. Start point: disused quarry next to the bridge over Rigg Beck. Rigg Beck is south of Braithwaite in the Newlands Valley in the Lake District, Cumbria. From the A66 take the B5292 into Braithwaite then take the little road going over the bridge, signposted Newlands Valley and Buttermere. Bear right at the y-junction then at the next y-junction keep heading forwards towards Buttermere for Just over a mile and the quarry car park is on the right just before the bridge over Rigg Beck. Parking: limited parking at the quarry next to the bridge at Rigg Beck. There are no public toilets the nearest ones are at Keswick. For refreshments there are two pubs in Braithwaite the Royal Oak and the Coledale Inn and a small shop that sells everything. There is also the Middle Ruddings Hotel close to Braithwaite on the A66.